The process of learning to write begins very early for many children. The oral and written language experiences children have at home, day care, preschool, and kindergarten contribute to their developing ability to communicate in writing. Adults in daycare settings and preschools can promote the development of writing skills by offering informal opportunities for children to observe, explore, and experiment with writing. 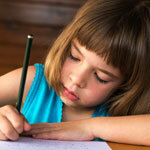 When children observe adults writing in order to accomplish real tasks, they learn the value and function of writing. Caregivers can involve the children in writing brief notes to parents or listing the foods that are to be purchased for the next day's snack time. It's a good idea to have a box of writing tools and materials available for children to use when they want to engage in independent writing. The materials can be arranged on a special table that is set aside just for writing. Informal writing opportunities continue in kindergarten. Begin formal and organized opportunities for students to engage in writing. For example, create an "office center" in the classroom and set aside a special time when children are allowed to work in the center. The office center should contain everything students need to scribble, design signs, send notes, record telephone numbers, or write stories. Although many kindergartners can recognize some letters, words, and phrases, they may revert to drawing or scribbling when encouraged to write a story. Accept this as a valuable attempt at writing. "Invented" or "phonetic" spelling is when a young child writes a word the way that it sounds without concern for spelling the word correctly in the conventional sense. In the course of the school year, some kindergartners will experiment with invented spelling and begin to move closer to "standard" spelling. Treat such development as part of the natural process of emerging literacy. Attempts to use emerging skills should be warmly supported. Throughout first grade most students will still use some invented spellings, especially for longer or more difficult words. Their attempts should be encouraged, supported, and then followed by instruction. Students should also be taught rules for punctuation and capitalization, beginning with the most common rules appropriate to the grade. By the end of first grade, students should be able to use ending punctuation (period, question mark, exclamation point) correctly, as well as consistently capitalize the first word of a sentence, names, and the word I. As students' writing ability develops, you can help them to develop their skills further. For example, students may need help with word choice so that their writing becomes powerful and interesting enough to grab and hold a reader's attention. Because beginning writers have so many areas of need that they could potentially work on, it can be helpful to identify two or three areas that will make the most difference in an individual student’s writing and then work on those first, before moving on to other areas. For example, consider a beginning first-grader whose writing is very difficult to understand because words are run together and incorrectly spelled. This student might benefit from an initial focus on putting spaces between words, learning to spell a small set of common irregular words, and improving phonetic spelling. When those skills have been learned, instruction would move on to the next set of skills that would benefit the student’s writing the most, such as including ending punctuation and increasing productivity. At these grade levels, most students have developed sufficient basic writing skills so that they can produce somewhat longer pieces of writing (more than a few sentences), although continued instruction in spelling and other basic writing skills will remain important. At these grade levels, students can learn more about how to organize a piece of writing (e.g., a narrative typically has a setting, characters, and a plot line with a problem and a resolution). They also can begin to apply writing processes such as planning, revising, and editing their important pieces of writing, although they will typically need considerable support from their teachers in using these processes. Poor writers at these grade levels may be struggling with difficulties in spelling, handwriting, and other basic writing skills that interfere with their abilities to write. At the second and especially third grade levels, teaching children how to write good sentences through sentence combining activities can also be very effective. Please see further discussion of sentence combining below. To help a student’s development as a writer, focus instruction on each area. Writers should draw on their experience and prior knowledge. The paper should be interesting and hold the reader's attention all the way through. The piece of writing should contain details that support the writer's topic. Voice gives a sense of the writer's personality and style. Over time, a teacher should get the sense of "this is Johnny's paper," because Johnny's voice is different from other students. Voice conveys feelings and emotions. The language should bring the topic to life for the reader. The voice should be appropriate for the topic, purpose, and audience of the paper. Sentence fluency effects the readability of the paper. Do the sentences flow from one to the next? The writing should sound natural — the way someone might talk. The sentences should have different beginnings, not all starting with then. The paper should have complete sentences, not fragments. Organization is the structure of the paper. The paper should follow a logical sequence. There should be an inviting introduction that "hooks" the reader. The body should give supporting details to the paper's topic. The ending should tie everything together. Word choice allows the reader to form a mental picture as a result of the words used by the writer. Thus, words should be illustrative and powerful. The use of action verbs may be used to show the reader what is happening. The adjectives should be as descriptive as possible. Unique phrases or words may catch the reader's eye. Conventions consists of spelling, punctuation, capitalization, grammar, and paragraphing. Conventions enhance the readability of the paper. Spelling, capitalization, and punctuation should be checked, revised, and corrected as necessary throughout the "draft"process. Paragraphing should reinforce organization. Use your districts writing standards to determine the standards that your students will be responsible for mastering over the course of the school year (e.g. contractions, paragraphing, etc.). Some of these concepts may not be appropriate for all grade levels. Understanding the traits listed above will enable you to help your students become good writers. Writing is a combination of skills and higher order thinking. For students to become good writers, the skills must be taught systematically and explicitly. This includes teaching sentence structure (independent clauses, dependent clauses, and phrases). Students can experiment with moving elements around in sentences. For example, once students have learned the Noun + Verb + Where Phrase pattern (e.g., “The pioneers set camp next to a bend in the Mississippi River.”), they can play with moving the “where” phrase to the beginning of the sentence (“Next to a bend in the Mississippi River, the pioneers set camp.”). No sentence can contain more than two of the following words: and, but, so, then. No sentence can contain more than 22 words. Use the noun or proper noun in every other sentence. If there are multiple male or female characters, or multiple things, name the nouns in every sentence. Or reorganize the sentences to refer to only one subject at a time. Preview vocabulary words that should be included in the writing. Teach subtle differences between words (e.g., tell or inform). Teach slang and the standard English equivalent (That is way more expensive. That is far more expensive.). Teach students to use common, bland adjectives (e.g., nice, good) sparingly, in favor of more precise descriptive words (e.g., thoughtful, caring, gentle). Identify "filler" words that can be removed (e.g., very, fun, big, so, then). For early writers, this scaffolding is helpful. As writing becomes more complex, students learn how to manage run-on sentences and fragments. They no longer need to adhere to these rules. Studies have shown that teaching grammar in isolation yields poor results, but grammar applied to the act of writing has a positive effect. The components of grammar and syntax can be taught explicitly but should be tied immediately to writing assignments. Teaching the mechanics of writing does not need to be tedious; as foundational skills, they must be taught systematically and explicitly. Sentence combining is a technique for teaching students how to write grammatically correct, varied sentences. This approach has been found much more effective in improving students’ writing than traditional grammar instruction (e.g., sentence diagramming). In sentence combining activities, students are taught to combine short, simple sentences into more sophisticated ones. They may also be taught to correct sentence fragments and to simplify unnecessarily long, complex sentences into two or three shorter sentences. Generally this type of instruction would begin with specific practice sentences, involving kernel sentences that teachers give to students. The dog barked furiously at the intruder. The huge black dog barked furiously at the intruder. The dog, which was huge and black, barked furiously at the intruder. However, the teacher would not want to accept this from students: The dog barked furiously at the intruder it was huge and it was black — because that is a run-on sentence. Also, the teacher would not accept this: The huge dog barked furiously at the intruder — because that omits one of the key ideas in the kernel sentences (i.e., the dog was black). Mother made pot roast for dinner. The pot roast was delicious. Unfortunately, no one was hungry. These sentences could be effectively combined as: Mother made a delicious pot roast for dinner, but unfortunately, no one was hungry — as well as in several other equally effective ways. In sentence combining activities, teachers begin by modeling for students how to combine kernel sentences, using several examples of different sets of kernel sentences, usually with two or three sentences in each set. Then the students try practice activities with guidance from the teacher, followed by more independent practice activities. After children are successful with these controlled practice opportunities, the final step would be for them to apply sentence combining to their own written work, as part of the revision and editing process. Students’ ability to apply sentence combining to their own writing is the ultimate point of sentence combining instruction. It should be emphasized to students that the goal is for them to use grammatically correct and varied sentences, as opposed to sentences of one type only. A piece of writing composed only of short simple sentences sounds dull, but one with too many long, complex sentences may be difficult to understand. Teach students how to retell the text, in sequence. Retelling as a skill supports finding supporting details from which examples are drawn. Teach students how to organize supporting details in different configurations. For example, when comparing and contrasting, a student could write how things are the same and different back to back. Or a student could put similarities in one paragraph and differences in another. Sticky notes and index cards are especially helpful in these exercises. Teach how to summarize the text. Summarizing requires students to compress and identify what is important. The summary may be synthesized information from multiple sources. Summarizing supports writing topic sentences, conclusions, persuasive writing, and other writing requirements. Teach how to state the gist of the text. Like a summary, it may be synthesized information from multiple sources. Unlike the summary, the gist is the main idea in its most compressed form. Try assigning a word limit, longer at first and then fewer words. For example, tell me the gist of Cinderella in 30 words, now in 20 words, now in 17 words. The gist is the topic sentence. At every grade, teach the writing process. The process remains the same but becomes more sophisticated as students grow older. By following the same process, students practice until it becomes automatic. This step is an oral and written rehearsal of ideas. The teacher explicitly teaches students to organize their thoughts before the student writes. Preview the relevant vocabulary and ensure it is used during brainstorming. This should include academic vocabulary (e.g., illustrate, determine, evaluate) and content area words (characters, setting, velocity). Explicitly state that students must use these words when answering questions orally and when writing. Demonstrate how these words and phrases are used (syntactic instruction) both orally and in writing. For example, in English we "determine whether (or not) to ____"; we don’t "determine of" or "determine for." This explicit instruction followed by oral practice will produce better writing results. Ask appropriate questions to direct the students toward your goal for the task. When asking and answering, ensure students use nouns — not pronouns — when speaking. This ensures students understand that in writing, sentences cannot be littered with "it," "he," and "she." Teach students to say what and who they are talking about, so that listeners and readers can follow their meaning. Accept any relevant contribution from the students in order to activate prior knowledge and creativity. Establish a safe environment. Ideas that may be pertinent later, or are tangential, can go on a sticky note and put in a parking lot. Parking lot ideas must be revisited before wrapping up brainstorming. Provide cues either directly (giving information from the text) or indirectly (giving additional information about the text) so that students are free to share their knowledge, guess, predict, or think creatively. Understand and expect that each student’s ideas are equivalent to their ability level. Use a board to write down all of the student’s ideas so that a discussion can be generated. When a visual cue is used, students are able to see and make connections between ideas. Use metacognitive strategies at this stage of the writing process. Demonstrate how students can ask themselves key questions. For example, have I addressed the assignment? Do all my ideas belong? Do any ideas not belong? What is the most important point? Which thoughts are related and how? What is the gist (summary)? Gradually relinquish responsibility for leading brainstorming. Get the students to brainstorm independently within an established time limit. Circulate and provide support. Explicitly teach how to retell the key details from text. This can be practiced as an isolated skill and then incorporated into writing assignments. Explicitly teach how to express the gist (main idea or synthesized information). This can be practiced as an isolated skill and then incorporated into writing assignments. The gist becomes the topic sentence and conclusion. Use graphic organizers, maps, index cards, or sticky notes to arrange information formally by illustrating particular text structures or concepts. Use a two-column note-taking format to identify main ideas and details while paraphrasing the information in the students’ own words. Teach students the basics of paragraph structure using topic sentences, details, and concluding sentences. Start using a basic level paragraph such as the sequential paragraph. Once this is mastered, move on to the other types of paragraph frames, such as enumeration, comparison, contrast, cause, effect, opinion, and descriptive. Have students start to use the skill of elaborating on thoughts within the basic paragraph frames using questions of what, where, when, why, and how. Summarize using information gathered from all the tools described above — graphic organizers, outlines, two column note-taking, or paragraph frames. Write in complete sentences during the organizing stage. The students then copy the sentences into their rough drafts. For students using notes, the teacher should review good sentence structure before the students write their thoughts into their rough draft. Students using a map should first order and sequence their thoughts, put those thoughts into sentences, and put those sentences into their rough draft. Students can do multi-paragraph writing by linking single paragraph frames together. Proofreading is the ability to apply critical contemplation to what has been written, so the students take themselves away from a personal attachment of the written document and become objective observers. Publishing — or final draft — is the last step in the writing process, in which the writer finalizes his/her thoughts, checks that all steps have been completed, and recopies or rewrites the written piece to satisfaction. If all of the steps have taken place successfully, the written piece is completed. What do I do with struggling writers? Explicitly teach the specific writing skill(s) in which the student is weak (e.g., spelling and other mechanics; word choice; organization). This obviously will vary for different children, as well as by grade level. However, within a grade, many types of writing difficulties do tend to recur across children. For example, problems with organization of writing are common and could be addressed through a whole-class or small-group lesson on organizational aids such as graphic organizers, outlines, and maps. Assessment of children’s writing is important for helping to determine individual children’s needs. In evaluating children’s writing, teachers should be aware of “presentation effects,” the tendency for teachers and other evaluators of writing to put undue emphasis on mechanical errors in their evaluations. Presentation effects can lead teachers to overlook strengths in the writing of children whose basic writing skills are weak, such as strengths in the quality of ideas. The use of rubrics in assessment can be helpful in ensuring that important components of writing are evaluated fairly, and rubrics are also very useful to children in conveying clear expectations for different writing assignments. Emphasize to children the importance of getting their thoughts down on paper before worrying about mechanics of writing. Mechanics of writing are important, but many poor writers tend to over-focus on mechanics, which hampers their ability to think about other important aspects of writing such as quality and elaboration of ideas. Mechanics can also sometimes keep them from even getting started on a piece of writing. Use technology. Technological aids such as computers, iPads, and various kinds of writing software can be a tremendous help to children, especially to those with specific disabilities that involve writing. Although technology certainly does not eliminate the need to teach writing directly, it can make the process of writing, as well as of revision and editing, much less burdensome. Allow choices in writing whenever possible. Of course, some prescribed writing assignments will be part of most school curricula, but if children have choices of writing topics some of the time, this can greatly enhance their motivation to write. Encourage listening and responding to read alouds, as well as other reading-writing connections. For example, students can be encouraged to use new vocabulary words they have learned in reading as part of their writing; they can use writing to summarize a story that they have read (or heard). Allow students who have difficulty with writing to first respond by art (drawing their favorite part or character) or drama (rehearsing the story). This extra time allows writers to rehearse their ideas before putting them on paper. Provide time for students to talk about their writing with each other, as well as with the teacher. Students should be taught to provide constructive feedback to each other that will help each student to improve his or her work. Feedback also should always recognize what is positive in other students’ work. For students in second grade and beyond, follow the writing process closely. Teach the process to mastery and encourage students to gradually take responsibility for each step. Provide close supports and then gradually remove the scaffolding. Start at the students’ current skill level. Do not assume students have skills until those skills are demonstrated. Most important, celebrate writing. All students need to feel that their work is valued. After a student has gone through the process of brainstorming, rough draft, editing, revising, and final draft, celebrate their written work! Celebrations could include inviting another class to hear the stories, hanging papers in the hallway, or allowing the struggling student to read their work to a special staff person of their choice. Berninger, V.W., Abbott, R.D., Jones, J., Gould, L., Anderson-Youngstrom, M., Shimada, S., et al. (2006). Early development of language by hand: Composing, reading, listening, and speaking connections; three letter-writing modes; and fast mapping in spelling. Developmental Neuropsychology, 29, 61-92. Graham, S., McArthur, C.A., & Fitzgerald, J. (Eds.). (2007). Best practices in writing instruction. New York, NY: Guilford. Haynes, C. & Jennings, T. (2012). Listening and speaking: Essential Ingredients for teaching struggling writers. In L. Moats, K. Dakin, & R. Malatesha Joshi (Eds.) Expert Perspectives on Interventions for Reading: A Collection of Best-Practice Articles from the International Dyslexia Association. Baltimore, MD: International Dyslexia Association. Van Cleve, W. (2012). Writing matters: Developing sentence skills in students of all ages. Greenville, SC: W.V.C.ED.